eTransmit for Autodesk Revit 2015 is not a new Add-in for Revit, indeed it has been around for a number of years no doubt inspired by the AutoCAD Pack n' Go utility bonus tool that came with the bonus tools of AutoCAD R14 way back in 1996. Both tools effectively collects all the resource files needed by AutoCAD or Revit streamlining the file collection process and simplifying the issue/transmission process of design data, on to clients or partner companies. Customising view types to include \ exclude in the transmittal. To anyone who is not familiar with either ther AutoCAD or Revit eTransmit function, it enables users to copy a Revit model and dependent files to a single folder for Internet transmission. The command is accessed from the Add-ins tab, and choose the 'transmit a model' command. A dialogue box pops up shown below, enabling the user to choose a variety of transmittal/archival options. It also has other purposes, for example the Internal archiving of a project, the cleaning up of a model, upgrading a legacy file to a newer format as well as collaborating between different consultants and disciplines. You can transmit any model that has been upgraded to Revit Release 2012 or later and is saved and closed. During the transmittal process, eTransmit copies the versions of the host model and linked files that are stored on disk. So it is essential that any desired changes are saved to your files before running the eTransmit utitlity. Although Revit Release 2011 and earlier files can be transmitted, they cannot be upgraded and will not be checked for additional linked files. Like the AutoCAD eTransmit facility you can select to a variety of tasks as per the image above, but including things like 'stripping out' of worksets, including linked models and markups etc. There are also options to purge out unused families and settings. A common problem when sending Revit models to someone is neglecting to include dependent files. In some cases, not including these files can make the model unusable by the recipient. 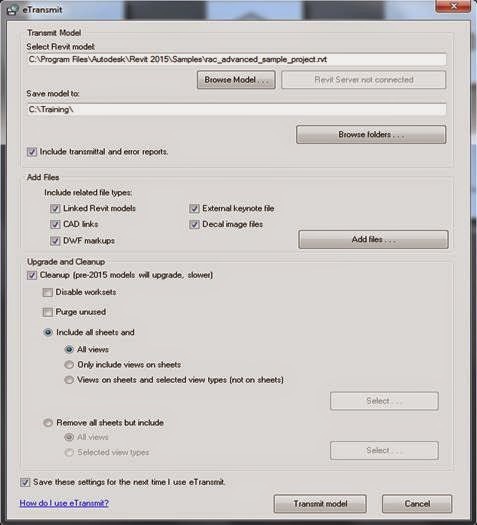 With eTransmit for Autodesk Revit 2015, dependent files can be included automatically in the transmittal folder, reducing the possibility of error. All fully specified (absolute) paths of dependent files are converted to relative paths or "no path" to ensure that the dependent files can be located by the model. It is worth noting that certain Files not included in the etransmit gather process, which include Point cloud files, the Shared parameter file, Lookup tables, Material rendering images (textures), as well as External references within linked CAD models and external font files. However, users can manually copy these files to the transmittal directory after the eTransmit process is complete. No doubt in the future versions to come additional features will hopefully manifest including the ability to send an email notification on a transmittal and upload options to Buzzsaw, Vault and other Cloud colloboration, storage and management systems. Along with the ability to automatically add the ommited files like shared parameters and look up tables etc. But in any case the etransmit tool is a useful asset to any design office having to work with Revit data.